The staff of Spartan Insurance Agency L.L.C. are crop insurance specialists; it's what we do all day everyday. Our staff has over 200 years of combined staff experience in crop insurance and agriculture finance. We pride ourselves on service and quality you can count on. Call us for your crop insurance needs at 1-800-888-2767. To locate the agent in your area, check the Spartan Location Page. To provide our insureds crop insurance choices and other risk management tools that will help maintain and increase farm profitability. 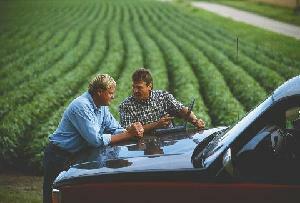 We specialize in crop insurance and serve our customers to the best of our ability. We will help you develop a crop insurance program that will be the foundation for a sound marketing plan, give you the protection you want and the peace of mind you need. We work with dependable, knowledgeable companies; QBE NAU, Great American, John Deere Risk Protection, Rain and Hail, ADM, Farmers Mutual, and International Agriculture Insurance Company. We will continue to maintain good working relationships with other agri-businesses to generate quality information that allows you to make better, more informed decisions. Spartan networks with many agri-business and grain marketing agencies to provide an added-value service to our customers. If you want to find out more about our products and services, or you have a question, please contact us at 1-800-888-2767 or submit your question from our contact form.